Our first trip to India as tourists ended in what was then Bombay in 1989, almost 28 years ago. We did not enjoy the city as much as we thought due to the very visible poverty everywhere, many people sleeping on the streets and roadsides. It has all changed now. The city is vibrant with new buildings, shops, hotels, many cafes and restaurants. 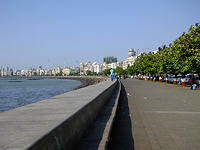 The Marine Drive waterfront is now a popular promenade and the place to see and be seen - strolling along day and night with the cityscape of Mumbai lining the wide sweep of the bay. Along Marine Drive there are many of buildings dating back to the Art Deco period when the land here was reclaimed from the sea, and this could become the Miami of the East. 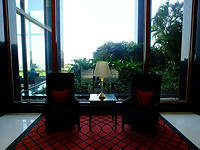 We checked in at the Trident Nariman Point by the waterfront. 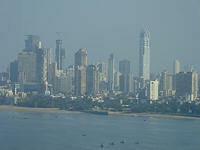 Our room was looking out to the Mumbai cityscape and the sea. This is a good city hotel popular with business and pleasure travellers. 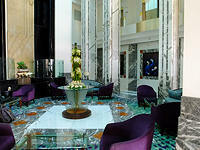 The lobby is elegant with large windows looking out to the seafront. There is a lovely lobby cafe serving delightful afternoon tea and afternoon buffet of sandwiches and cakes. The buffet dinner that night at the hotel restaurant was excellent too. 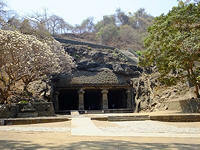 Next morning we were off to the World Heritage site of Elephanta Island. It is a forty-five minute slow boat ride to the Island. We boarded the public shared boat by the Gateway of India. The boat was packed with visitors and locals and as the boat gently cruised out of the Mumbai Harbour passing many other boats and fishing boats we got the best view of the majestic Taj Mahal Palace hotel on the harbour front. We are using this magnificent hotel in our Special hotels category. We arrived on the island and got on a toy train to the base of the stairs to the cave complex. From here we began the climb up the stairs between souvenir and refreshment stalls to the top. Entering the gate the large four pillars stand at the entrance to the rock temples. 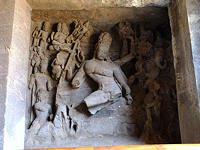 The rock carvings representing religious stories are magnificent. Some of them are still well preserved with detailed carvings after so many years of existence. The Shiva dedicated temple consists of courtyards, halls, pillars and shrines. We were back to the Gate of India in time to have lunch and hotel inspection at The Oberoi. Intriguingly we came to this hotel in 1989 and had a drink at the hotel lobby. I remembered the tall glass window where we could look out to the street below and sea on the other side of the road. The tall windows in the lobby are still there but décor has been changed now with more modern and stylish presentation. This is an excellent 5* hotel in a superb waterfront location. 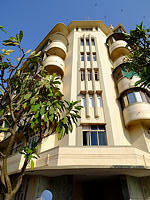 We use another Oberoi hotel in Shimla and we are going to use this one in Mumbai in our Deluxe hotels category. The lunch was excellent too with our favourite dish, Karimeen (fried fish wrapped in banana leaves). Along the water front we also visited another hotel called Marine Plaza. As I mentioned earlier the waterfront is full of Art Deco buildings and, although modern, this hotel is designed in a similar style. As soon as you enter the front door a magnificent staircase faces you like a Hollywood movie from the forties. The most magnificent design feature is the lobby sitting area just behind the front desk. The hexagonal shaped area with open floors all the way to the top where the glass roof is actually the bottom of the rooftop swimming pool. One can see the water and swimmers too. Each floor also has a corridor and balcony to look down to the lobby, the lifts and the swimming pool above. It is a bit wacky but stylish too. We are using this hotel in our Superior hotels category. Next day is the last day of our fifteen day trip, and we used it to see other Mumbai city sights such as the Dhobi Ghat, High Court, St Thomas Cathedral, University of Mumbai, Ghandi Museum, the Prince of Wales Museum, Hanging Gardens and the local markets etc. We enjoyed Mumbai and certainly enjoyed the whole trip from Kochi Harbour, up to the tea plantations of Munnar, the spice country and wild animals of Periyar, Kerala backwaters, to the beach resort in Kovalam and finally to the city of Mumbai. This trip has been the most enjoyable and very relaxing. I am recommending this trip to all clients who wish to visit India and enjoy a wide variety of experiences.